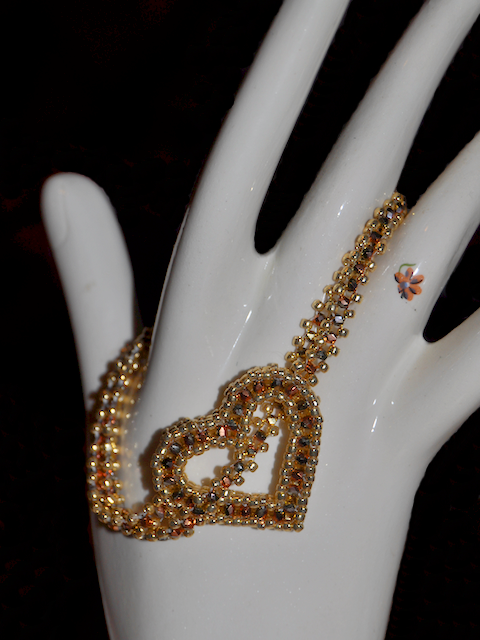 This pendant is my design. I stitched the cab with RAW, layered a row of diamond weave over the top and then added St. Pete stitch along the sides. 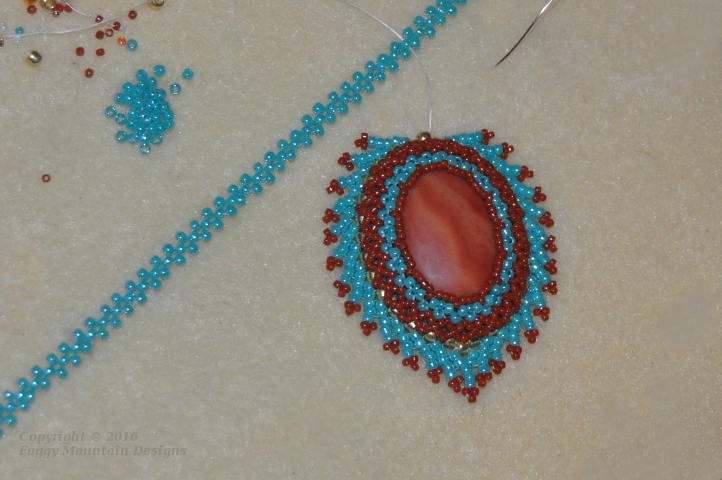 The pendant is almost complete. 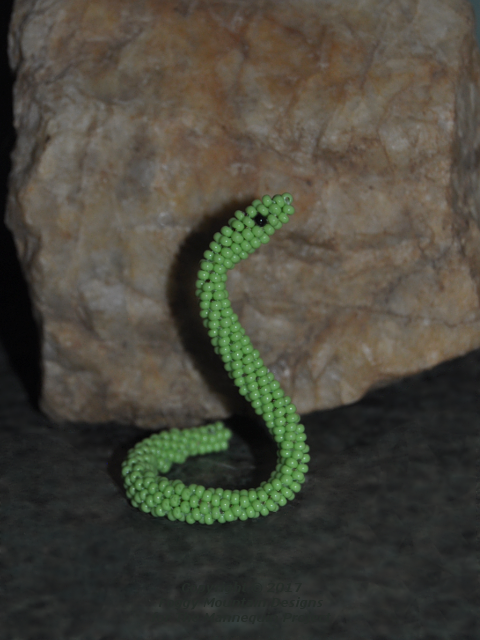 I’m still trying to come up with a rope that I like. 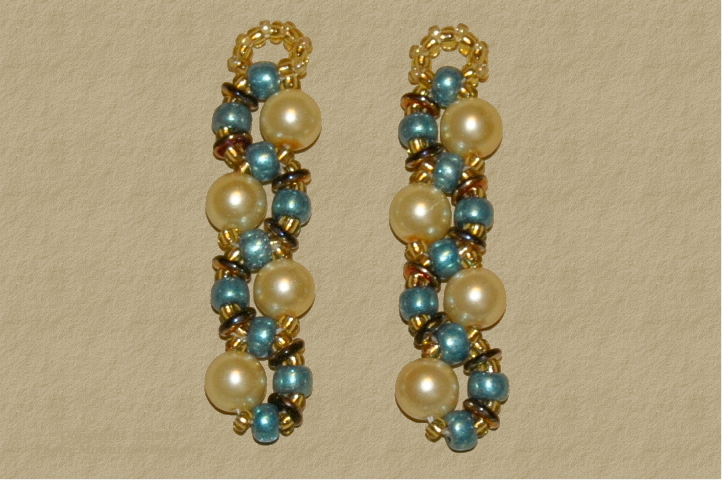 Two new pair of earrings waiting for ear wires. The idea for the Rulla/RAW pair came from my little duo fan. 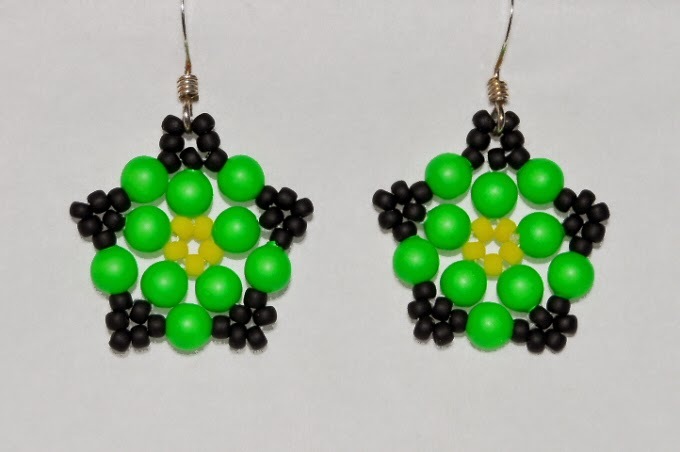 Btw, Beth wrote a tutorial for her modified version of the duo fan earrings. You can find it here. 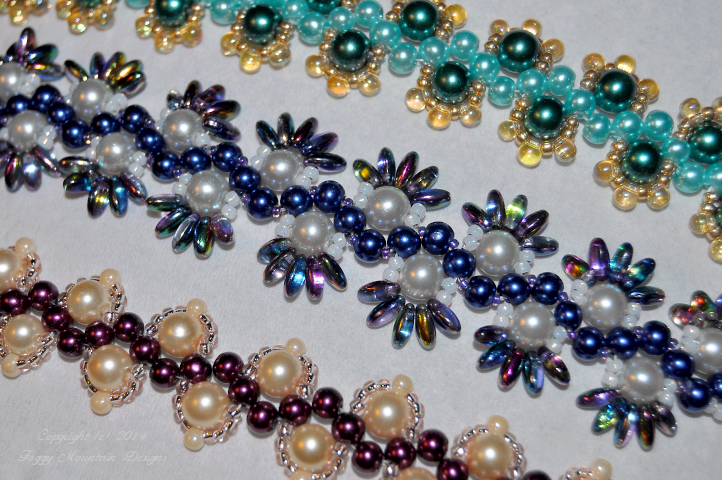 The Bead-it-Forward 2016 theme is “Space: Out there somewhere, there’s a cure”. 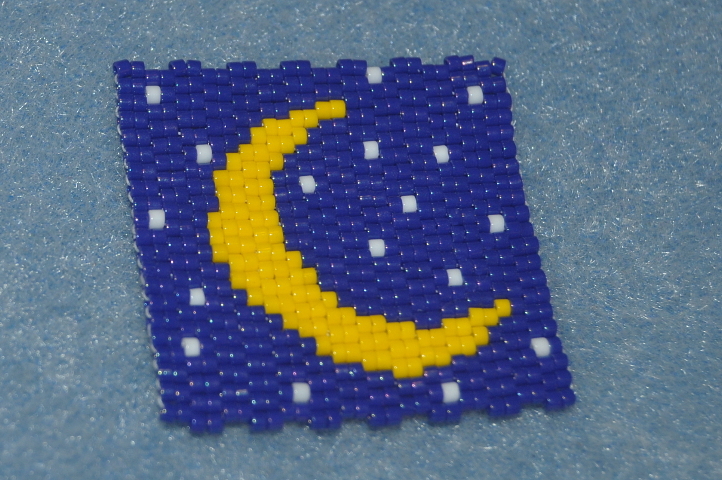 I worked Amy’s Crescent Moon pattern. 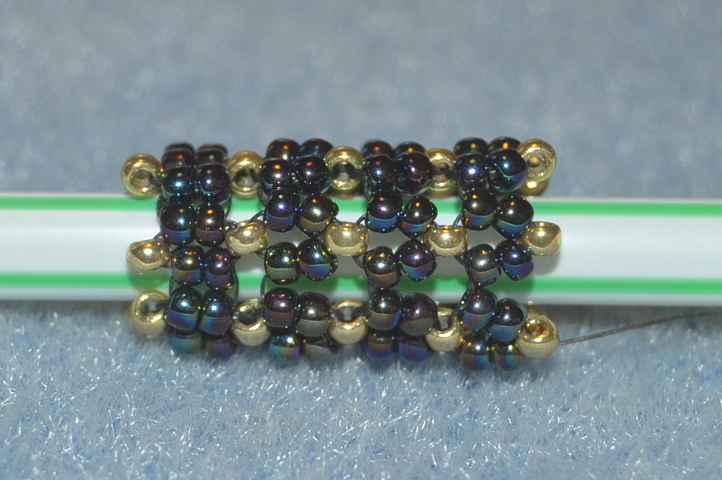 I also stitched a nebula square last night but haven’t taken a photo yet. 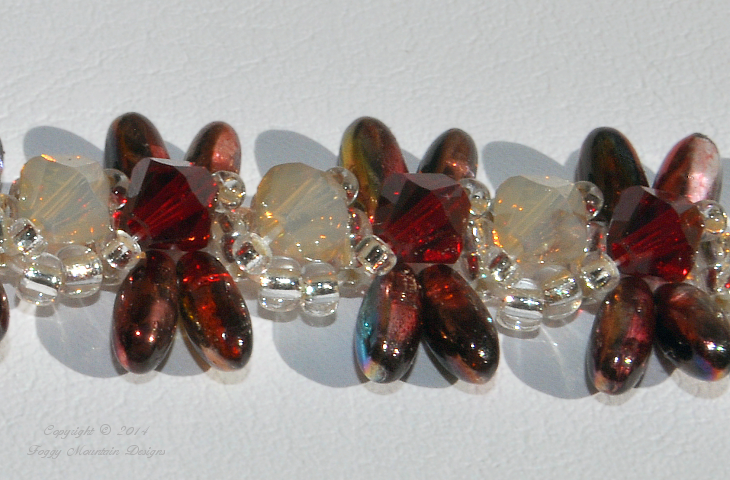 More Hubble stitch. This time I’m attempting to work it in 2-drop tubular. My base row is an embellished double ladder. My fingers don’t want to hold it but I was able to remedy that with a straw. 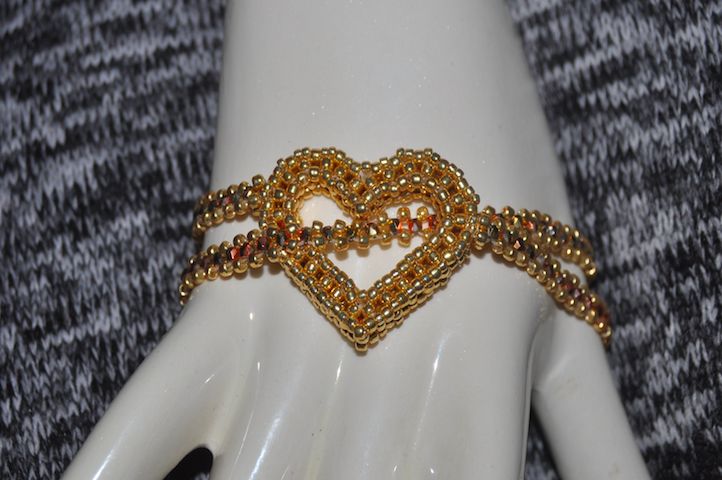 Based on an original design by Beki Haley (her free tutorial can be found here), beaded by me. 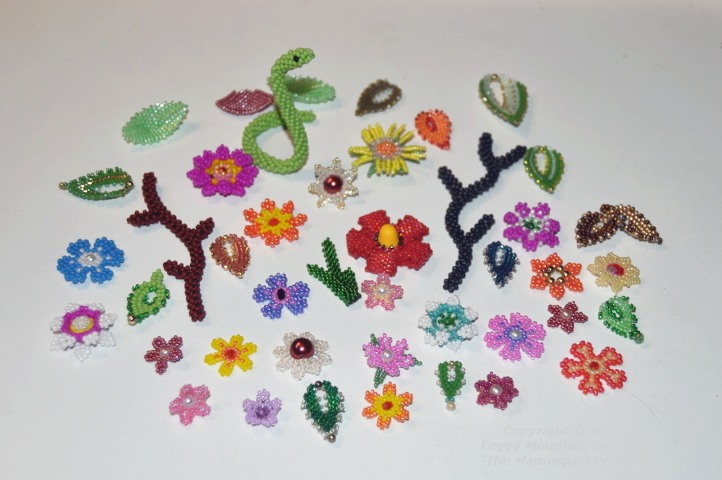 I replaced the mini daggers with Rizos and turned the dragonflies into butterflies. 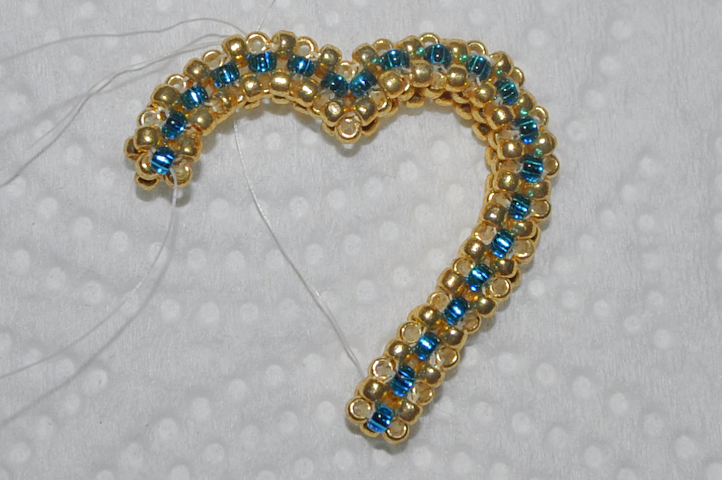 The fingers are working again and I’ve gone crazy beading the last three days! 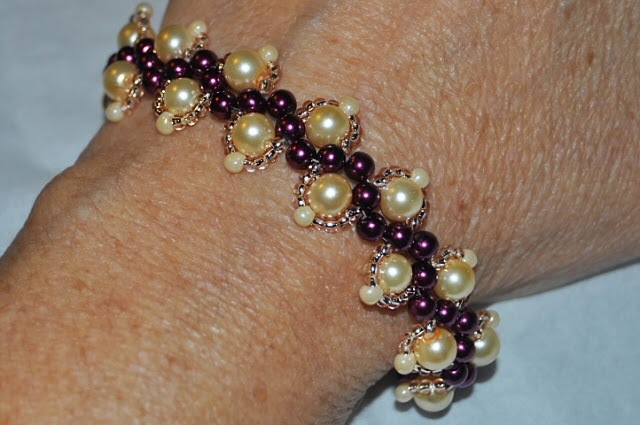 These bracelets are a variation on a pattern by Elaine Teevens (Anemone Bracelet) in the Aug/Sept 2014 issue of Beadwork. 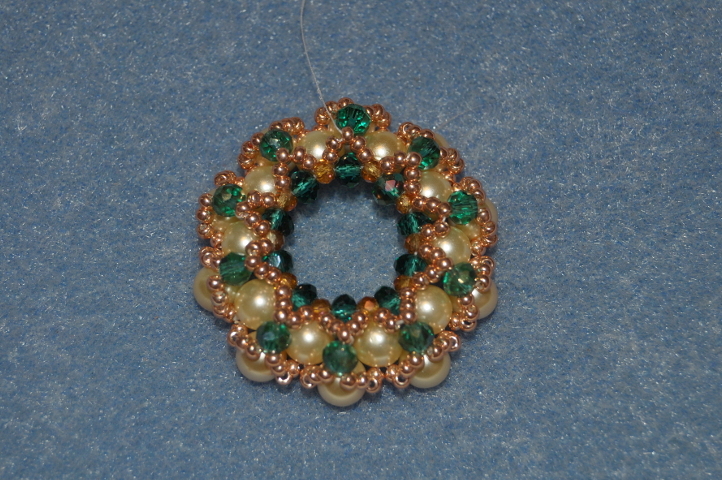 I worked the green/mint (the color is a little off) with three small drops. 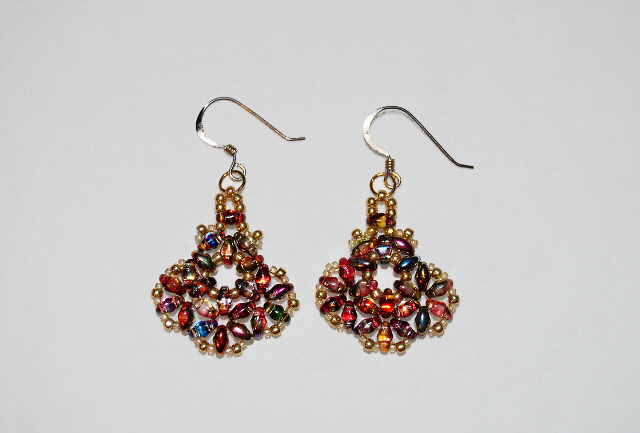 The burgundy/gold only has one small drop. 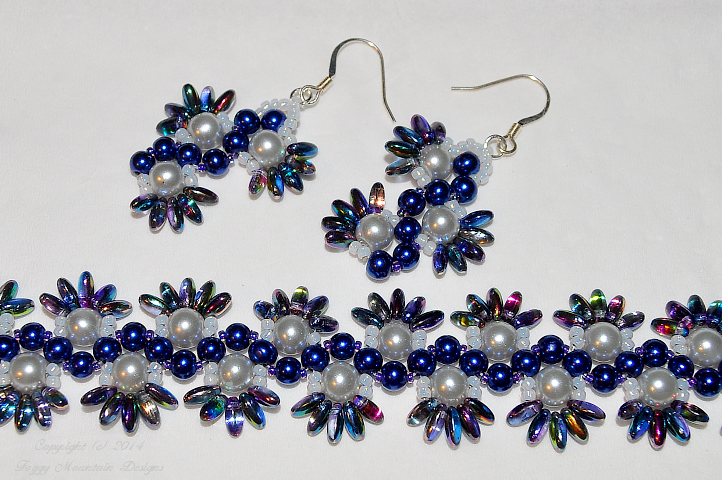 The blue/silver uses Rizos and I added 15’s between the 4mm pearls. 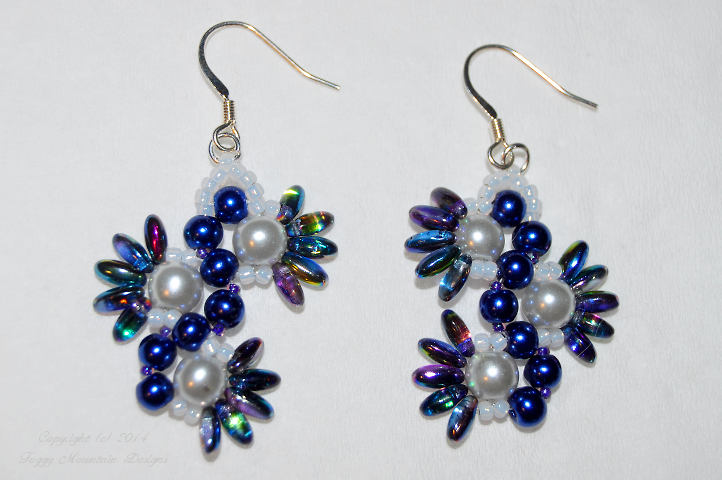 I made earrings to go with the Blue Peacock. 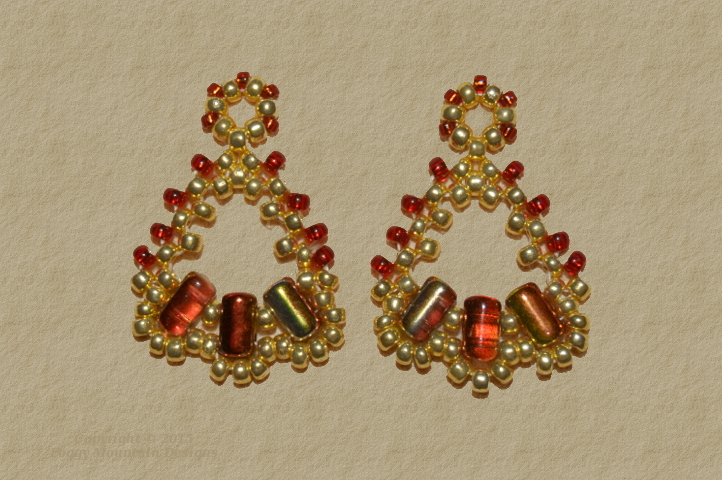 Beth Duo Earring Tutorial: Earrings made with Magic Red twins. 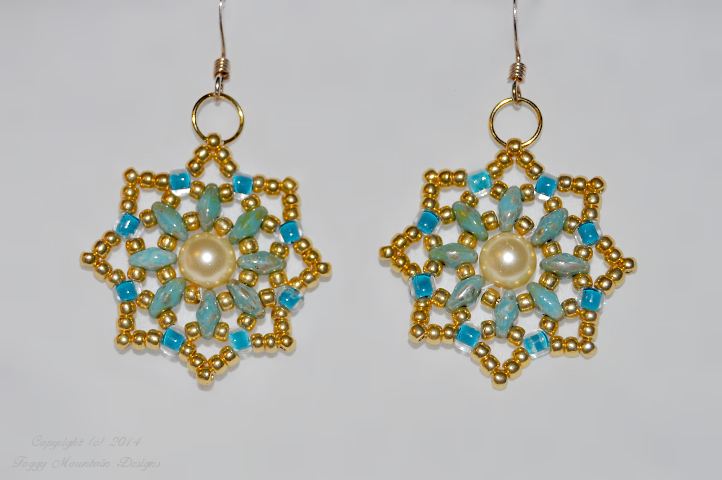 This is a modified version of a pattern by my friend Beth. 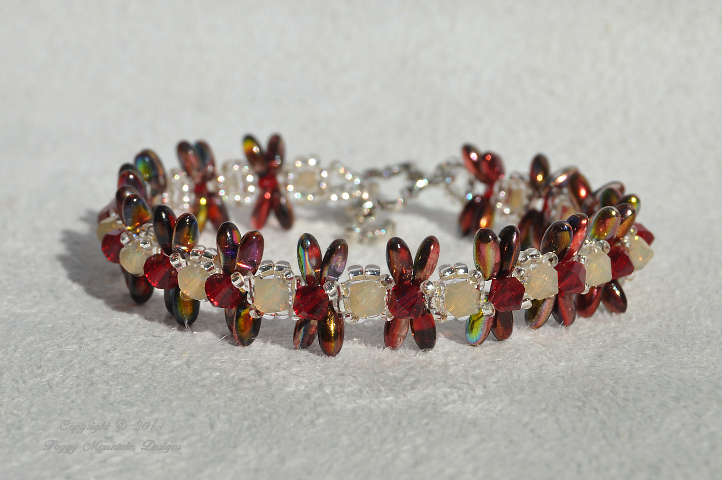 Get her original pattern here. 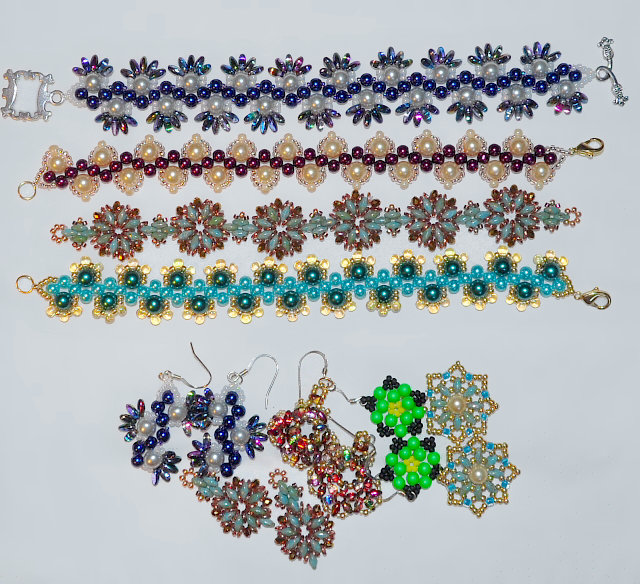 Last night my friend Lela and I had a beading get-together on the phone. 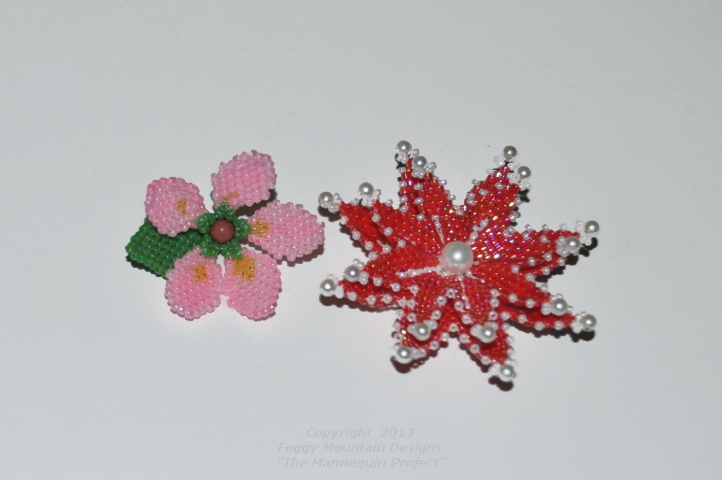 We chose the pattern Floweret from Beads Magic website. The green neons keep swapping back and forth between Beth and myself. We’ve both used them recently. 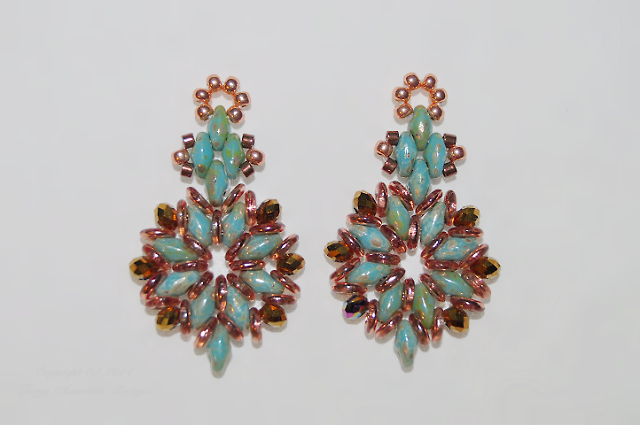 Turquoise picasso Super Duos with Apollo Gold rondelles and o-beads.